Biopsy Needles | Hart Enterprises, Inc.
Hart combines its versatile cutting edge grinding capabilities with lightweight, ergonomically designed hubs to provide outstanding accuracy and control on a wide range of percutaneous biopsy prodecures. Our differential bevel between stylet and cannula point further reduces coring and tissue entrapment for cleaner samples. Outstanding sharpness permits the use of thin wall cannulas which increases the sample yield for any given gauge…maximum result, minimum trauma. The Chiba and Franseen needles are manufactured in a variety of gauges and lengths. We will also accommodate and fabricate your exact requirements. Franseen Style Needles- A trocar pointed stylet and serrated outer needle assists in an accurate placement of the needle and clean, reliable removal of lung tissue. This wall cannula provides a superior cutting edge and a large sample. 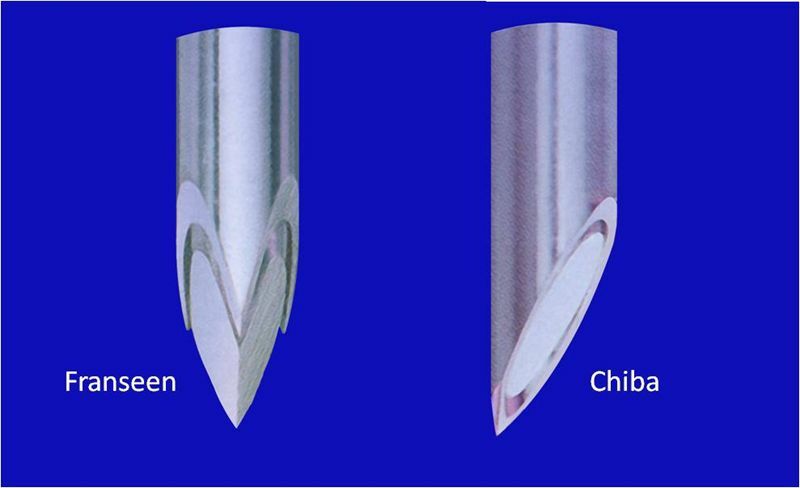 Chiba Needles- A matched point or differential bevel is available. The interlocking hub and cap yield high accuracy and low trauma for this fine-needle percutaneous, soft-tissue, aspiration biopsy instrument. 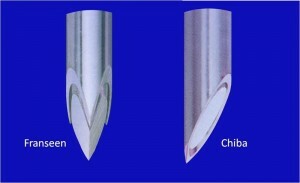 Chiba needles are also utilized for injection of radiopaque dyes. Needle stops available for a nominal charge. CM markings and Ultrasound enhancements available on all standard needles.